consists of over 3 hours of play-a-long tracks. Each of the 30 tracks has 12 choruses in different keys and tempos ranging from 60bpm to 140bpm. The Blues progressions vary in many Blues styles such as: Boogie-Blues, Rock-Blues, Swing-Blues, Funky-Blues, Slow-Blues, Latin Blues, Texas Blues, Jazz-Blues, Soul Blues, Classic Rock-Blues, Bossa-Blues etc. Each of the 30 play-a-long tracks consists of a video file as shown in the video clips below, mp3 file, PDF and MIDI file for each track. 30 Blues 12 Bar Progression Play-A-Long jam tracks to practice soloing. Andrew D. Gordon has created 30 Blues, Jazz and Rock Play-A-Long Jam tracks in many different Blues styles, keys and tempos for musicians to practice their soloing techniques. 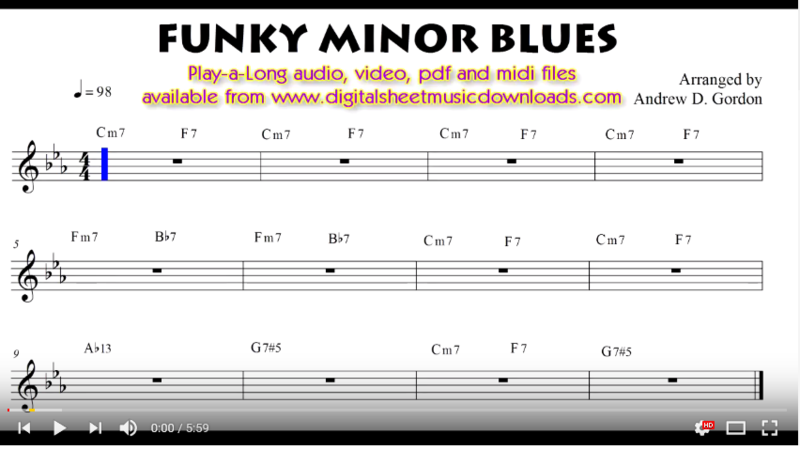 Each play-a-long track consists of video file as shown in the video clip below, mp3 file of the play-a-long track, pdf of the chord chart and a midi file of the track. Please make sure you have just over 1gb of hard drive space to download the data. Legendary guitarist Caleb Quaye (Elton John, Hall and Oates) says "A great resource indeed!" about the tracks.